Do you want to buy a spinning rod? The Shimano Solora Spinning Rod is one fishing rod that you can use with your spinning reel to catch fish. That’s because it’s made with a durable aeroglass rod. It also has a solid graphite reel seat. This fishing rod enables you to enjoy fishing using aluminum oxide guides that are reinforced. It also has comfortable cork handles for flexible fishing. 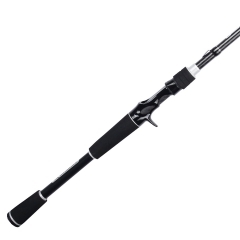 If you are a beginner in angling, you will find the Shimano Solora Spinning rod to be a perfect fishing rod. This review looks at these features in detail, their pros and cons and gives you a conclusion. One feature of the Shimano Solora Spinning rod is its durable aeroglass rod. 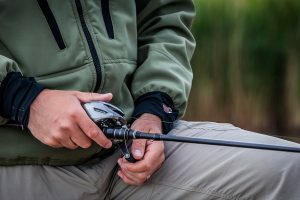 This rod is flexible, enabling you to feel even the softest of fish bites. It also allows you to cast further, which means you will catch more fish. Another feature is its aluminum oxide guides that are reinforced. 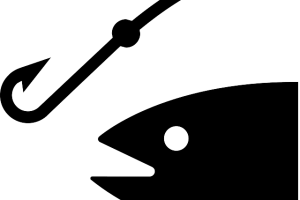 They enable you to detect fish strikes. That’s because the aluminum material transmits the fish strikes faster and accurately. This material is also sensitive as a result of it being reinforced. 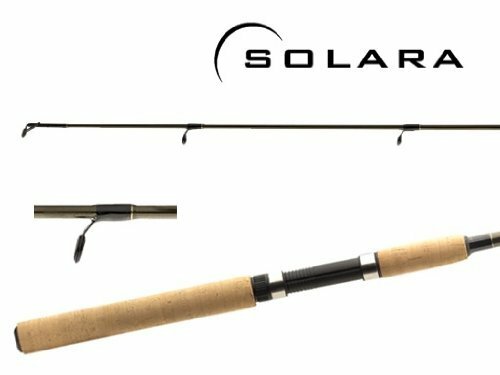 The Shimano Solora fishing rod also has comfortable cork handles. They enable you to hold this spinning rod quickly. You want a spinning rod that you can easily control, for example, when carrying out longer casts or catching bigger fish. The solid graphite reel seat enables you to lock it quickly. You can feel its blank with your finger. 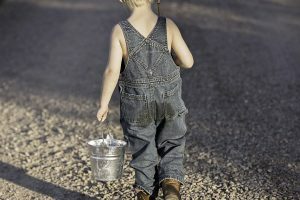 That’s when holding the reel and the rod. It also has a medium power that enables you to have fast action when fishing. 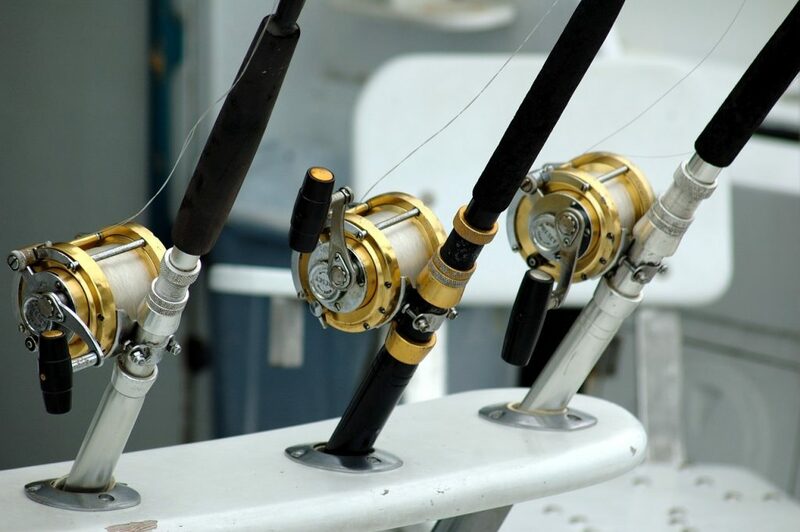 Keep in mind that power is the amount of pressure you will exert on your fishing rod to make it bend. The Shimano spinning rod enables you to turn it fast, which allow you to catch more fish. It also lets you have bigger catches for longer casts, for example, 14 yards. That means you will have wider areas to catch fish. One feature I found great on this spinning rod is its power. That’s because it allowed me to catch big fish. Its medium power features also allowed me to have fast action fishing. The comfortable cork handles made it easier for me to navigate waters that were quite rough. I also found it to be perfect for beginners, for example, my nine-year-old daughter. It had a greater sensitivity that allowed her to detect soft fish bites. Its reinforced aluminum oxide blades also worked well in salt water. It didn’t react, so I guess users will find it useful if you intend to use it for saltwater fishing. Its material is also ideal for the hands. I found the cork handles to be helpful for beginner fishing. It enabled me to enjoy fishing with firm holds. Its pricing is also good. That’s because, for $20, it lived up to its cost. I’ve used a lot of spinning rods; their downside is that their ease of use didn’t match their pricing. It’s also a perfect one if you plan to catch both smaller and bigger fish. I liked its 2 piece features which enabled me to break it into two. Its rating is also correct. That’s because I used smaller baits to load it. It also had greater sensitivity to large jig heads. It’s ideal for ultra-light action, which means if you have kids, they will enjoy your fishing expedition. I also found this spinning rod to be excellent when using worms to catch bigger fish on shaky rigs. Although it’s sold as a medium action rod, I found it to be quite stiff and medium heavy. That means beginners might struggle a bit to control it. Its price might be low, but I guess some users will find it to be heavier and thicker. 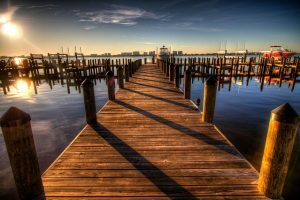 These features are ideal for anglers who prefer oceans or bay areas. I would also recommend that its manufacturers made replacement rod tips. That’s because many spinning rods, for example, the Shimano Solora Spinning Rod, don’t have replacement rod tips. That meant I had to replace the entire device after the tips broke. The Shimano Solora Spinning rod is a perfect fishing rod for you. Its pricing is spot on and allows beginners to enjoy fishing. I recommend you try it out, for example, when ocean fishing with bigger baits.